Technology can be utilized to help you get more done. If you’re falling behind on your tasks, Jennifer Bridges, PMP, shows you how task automation can help. Jennifer said she loves technology and was excited to show how tools can help make project management more productive. She focused on one feature of technology for this video tutorial, automation. First, she explained that automation is a technique of making an apparatus, process or system operate automatically. In other words, automation is a clever way to get more done with less time, money and effort. You’ve probably used some of these automations, such as software, apps, artificial intelligence (AI), gaming technology, mobile platforms, card readers or QR codes. They can do such things as track mileage, scan receipts, map trips, order and deliver food and track progress on a project. Jennifer offered seven examples of automation that can help you get more done. Use Email Templates: Not every email has to be personalized, especially if you’re responding to questions that you get all the time. Instead of typing out a response to each, you can just copy, paste and respond. Use Excel Functions and Macros: Programs that have built-in features to help you add up columns without having to do it in your head or reach for a calculator are going to save you time. Use Contact Lists: If you’re always looking up data to see if your contact information is correct, then using a contact list will help you cut out a step. Use Project Management Software: There are so many shortcuts with the right software that can help you with everything from budgets to calculating critical paths. Use Text Notifications: To keep teams on task or just to respond without having to compose an email, text notifications are a great time-saver. Use Inquiry Forms: Rather than having to do the data entry yourself, there are forms that can input the data for you. Use Registration Systems: These will help you to manage lists, locations, etc. Pro-Tip: If you’re constantly making reports, then using automating reporting software is another way to save time. With the right tool, you can get real-time data and be notified of progress automatically. 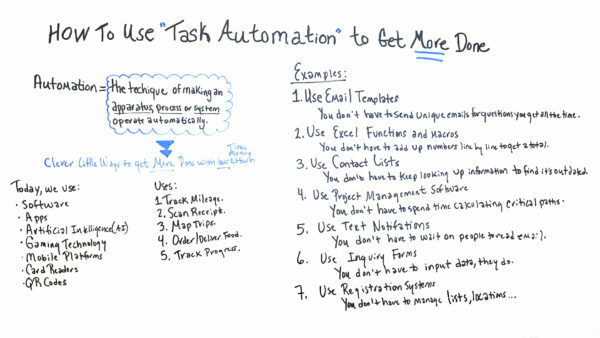 Today, we’re talking about how to use task automation to get more done. Well, I love this topic because I love technology. And in today’s time, technology really helps us do that. If we look at the word “automation,” it means the technique of making an apparatus, a process, a system operates automatically. Well, in today’s times, we use software, we use apps, we use artificial intelligence which we hear a lot about today, we use gaming technology, mobile platforms, card readers, QR codes, all kinds of technologies to help us do this. Some of the uses we may hear about today are apps to help us track mileage. So, if you are a business person or working on projects and need to track your mileage, we have things that do that and the software on the app does that automatically for us. We can also use software to help scan receipts. Again, if you’re a traveler and you’re accountable for different client projects, this makes and saves a lot of time for you. Also, now on our mobile devices we have maps that know from our calendars when we have meetings and if we put the locations in there, it already maps our trip and how to get there. We can also use apps to order food ahead so we can order it and we can just go pick it up using our app. We can also use apps to deliver food and they can now deliver it to us. We can also use apps to track progress on our project. So, let’s give some more specific examples of how task automation can help us save time. Okay, in iterations. So, some examples are if you use email templates then that means you don’t have to send unique emails for questions you get all the time. So, that allows you to get more done and use less time. Also, if you use Excel spreadsheets and within that, there are different functions. You can also create macros. So, I see some people just use Excel to maintain a list or numbers, but those functions can do more for us because you don’t have to add up numbers line by line to get a total and if you use that for some projects or some applications, you can have a lot of numbers. So, you wanna save yourself time of manually having to do that. And then if you’re like me, you mess it up and then you have to go start back again. You can also use contact list. And with contact list, again, you put your contact in there once and you maintain it and you update it, you don’t have to keep looking up information to find out if it’s outdated. If you’re like me, I used to save those old cards and then I would lose them and maybe they’re really old. So, that really helps with that. Also, using project management software, you don’t have to spend time calculating critical paths, you don’t have to repeat projects, you can duplicate projects if they’re similar, but it helps you track information. In today’s software, you can have different team members log in to track their time and their task so you don’t have to. We can also use text notifications. Nowadays that people are more on the go using their mobile devices although sometimes they may have e-mail on their phone, it’s sometimes easier for people to receive a text and just let somebody know, “Hey, thumbs, up thumbs down, I’m on my way, I’m parking,” or just some short notification. So, with inquiry forms, you can have those on your website and you can have people who are interested to fill that information out so you don’t have to. You can also use registration systems. So, if you’re having an event or you’re holding a class or having to maintain some kind of registrations, the software can do that for you so you don’t have to manage the list or the locations or send the reminders out or just keep a list to create badges. So, these are just a few of the examples and again, there are so many of these. And these are just some intended to spark some ideas on how you can use task automation to allow you to get more done. So, if you need a tool to help with your task automation, then sign up for our software now at ProjectManager.com.